Welcome to Forecast! 🙌 If you're reading this article, you've probably been invited by your agency to join in on your projects. As a Client you're invited to collaborate on projects under another organization, the agency. This means, you're able to view projects and tasks assigned to you, and report and edit your own time if necessary. The first thing you'll meet when you enter Forecast, and begin browsing around, is an interactive Product Tour. We'll try to guide you through some of the most important aspects for you, but here we've collected everything you need to know as a Client into one article. Before we move onto the actual use-cases for you, we want to walk you through some of the main terms used in the Forecast system. Tasks in Forecast are known as Tasks. Tasks can contain a lot of information, e.g. description, to-dos / subtasks, comments, files, labels, assigned people, and reported time on the tasks. Tasks live in columns in the Workflow board. Each column has a phase, i.e. to-do, in progress, done. The Workflow can only have one to-do and one done column, but it can have multiple in progress columns. Workflow is where the daily work is going on. Here, you can open tasks to read more, and you can see the progress of each task as it moves from to-do towards done and by the red progress bar at the bottom of each task. Navigating Forecast is super simple. The first page you meet when signing in to Forecast is the Upcoming Work. Upcoming Work is where you see all the tasks you're assigned to with a set deadline. This page is split into Overdue, This Week, Next Week, Future, and All. We have two main menus at the top of your screen. The first at the top left is the global menu, which takes you to other sections of Forecast, e.g. Projects and Time. The logo is always taking you back to your Upcoming Work. At the top right, you find the three other elements. Your personal menu, named after you, the universal Create button, and a Timer. Your personal menu takes you to My Profile, Help, Shortcuts, and the ability to Log out. My Profile is where you edit all of your personal settings, e.g. change profile picture, name, email, the language of the interface, your password, and notifications. The Create button lets you create Tasks, and the Timer lets you start a stopwatch. The Timer runs live across the Web App and Mobile Apps, meaning you can start a timer on your laptop, and report it on your phone, or vice versa. The best place to get a glimpse into the progress of your project is the Workflow. You get to your project by going through the Projects tab in the global top menu, and find your project in the list below. Open the project, and navigate to the Workflow in the sidebar. The Workflow shows all the tasks you're assigned to, and the progress of each visualized by the columns. You can open the task to view more details, comment on it, upload files, view the activity log, etc. Additionally, you're able to view the Team tab, which shows everybody who's connected and working on your project. If you need, you can also report time on projects and tasks as a Client. This is done through the Time tab at the top. Reporting time is super simple. You just select the project and task in the two dropdown fields, and type the number of hours you wish to register. If you wish to only report time on a project level, this is possible as well by leaving the second field out. You can also report time directly on tasks assigned to you, which are shown in the list below the fields. Additionally, you can report time on a task from the Workflow. 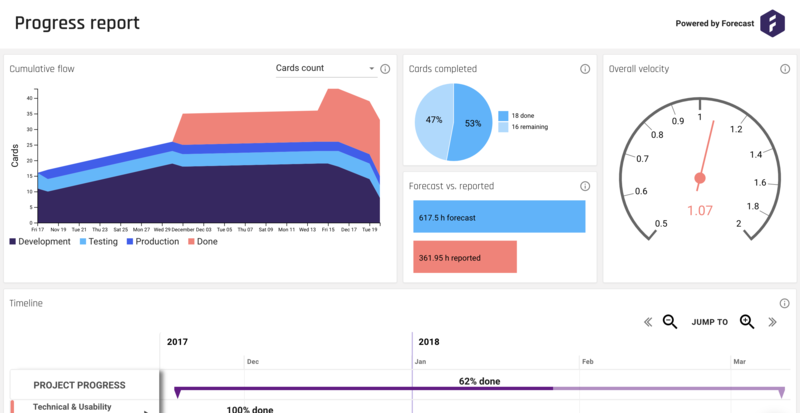 Forecast supports live insight reports with various real-time components. This is not by default shared with Clients, but you can always ask your agency to create an insight in Forecast, and share it with you through a unique password-protected link. Insights can give you valuable information on the progress of your project. Making you able to get a perspective, and follow your project more closely.